Despite Chase Farrell’s record setting 12 strikeouts, the Pippins offense couldn’t give him much support in a 3-1 loss to the Port Angeles Lefties on Friday. 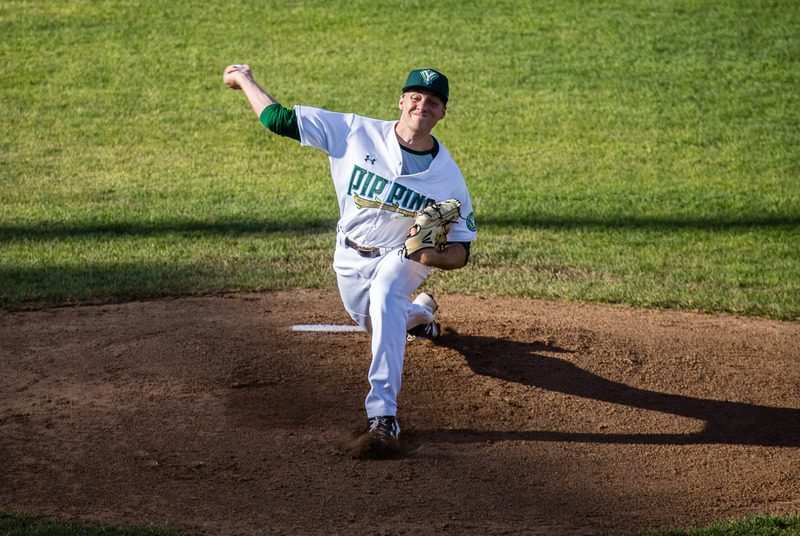 The Pippins entered the second half of their schedule looking to move pass a last place finish in the North Division of the West Coast League. The Pippins ended the first half with a record of 11-16. The Pippins got to Tyler Oldenberg early. After Nick DiCarlo flew out to deep left field, Elijah Greene and Kyle Dean hit back to back doubles to give the Pippins a 1-0 lead. After a walk to Jake Moberg, Cole Pofek hit a single over the first baseman Ron Brown’s head. Dean tried to score from second but right fielder Drew Minter threw a strike right to the plate, getting Dean by a few steps. The Pippins would end up stranding runners at second and third. Farrell took the mound for his second start of the season, coming off of a start where he went six innings of one run ball while striking out ten and not walking a batter. Farrell was strong early. After a leadoff single, Farrell retired the next three batters with two strikeouts. Through the first three innings, Farrell had allowed three baserunners, none made it past first, and racked up six strikeouts. The Lefties got to Farrell in the fourth. With two outs in the inning, Dalton Harum launched a ball over the center field wall, tying the game at one. Farrell would recover and post zeroes the rest of the way. Through Farrell’s seven innings, he struck out twelve without walking a batter. He gave up just the one run on four hits. His twelve strikeouts broke a Pippins record for most strikeouts in a game, held by Eli Morgan. Morgan struck out 11 batters on two occasions in 2014. Unfortunately for Farrell, the Pippins offense couldn’t score after the first inning. The Pippins stranded two runners in the fifth, sixth and seventh innings. Four of the six baserunners were in scoring position. In the eighth, the Pippins turned to Lucas Juarez. With two outs and a runner at first base, Jason Dicochea hit a ball just over the center field wall, giving the Lefties a 3-1 lead. In the ninth, the Pippins had an opportunity to make it close but they stranded a runner at second base to end the game. The Pippins have a chance to even up the series on Saturday. First pitch at 6:35.